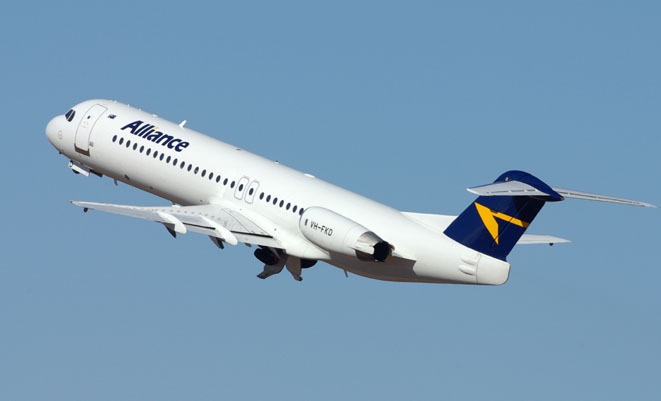 Alliance Aviation has confirmed the sale of two Fokker 100 aircraft for $15.1 million and reaffirmed full year earnings guidance for 2014/15. The mainly charter and fly-in/fly-out operator flagged the disposal of surplus aircraft in December 2014 in response to the changing schedules of its customers and the volatility in the resources and energy sector. Alliance chief executive Scott McMillan said the sale was part of structural and operating changes to improve profitability in the short to medium term. “Reducing fleet numbers and increasing utilisation of the remaining fleet will significantly improve productivity,” McMillan said in a statement on Wednesday. Once transaction is completed in mid-June, Alliance will have 28 operating aircraft in its fleet comprising 15 100-seat Fokker 100s, eight 80-seat Fokker 70s and five Fokker 50 turboprops which have 52 seats. Alliance said it also had two aircraft in storage. The company maintained underlying earnings guidance for the full 2014/15 financial year of net profit after tax of about $13 million. In April, Alliance announced moves to outsource heavy maintenance checks of its Fokker fleet to Austrian Technik Bratislava, resulting in the loss of 22 staff positions and 10 contractor positions. Alliance said in February it was working to secure more non-mining related work after it swung a net loss of $25.8 million for the six months to December 31 2014, compared with net profit of $6.5 million in the prior corresponding period. The statutory figure included a $41.4 million impairment charge on the carrying value of its aircraft fleet.